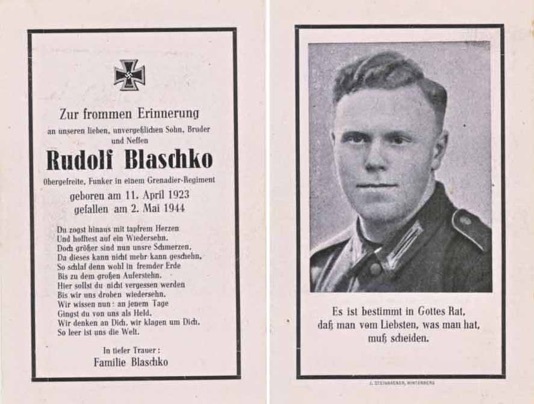 WW2 German Death Card (Sterbebild) for Brothers Rudolf and Walter Blaschko. Army Obergefreiter Rudolf Blaschko was a Radio Operator in a Grenadier Regiment. Killed 2 May 1944, Pomezia, Italy. He was 21. Single page double sided card measures about 2.5 x 4.25 inches. Includes a slip from the German Graves Office listing him as buried in Pomezia. 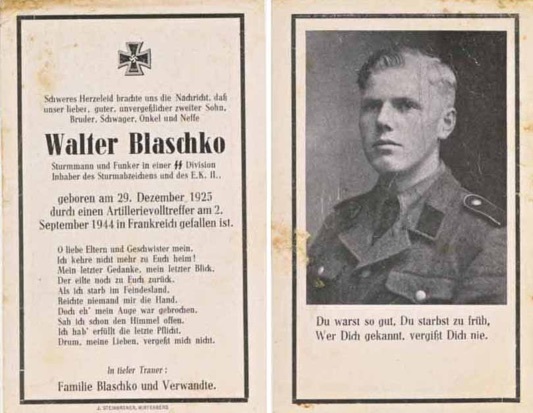 SS Sturmmann Walter Blaschko was a Radio Operator in an SS Division. He was awarded the General Assault Badge and the Iron Cross 2nd Class. He was killed by the impact of a full artillery round 2 September 1944, France. He was 18. Nice photo in his SS uniform. Single page double sided card measures about 3.75 x 2.25 inches. Rudolf is in excellent condition and Walter in good condition. 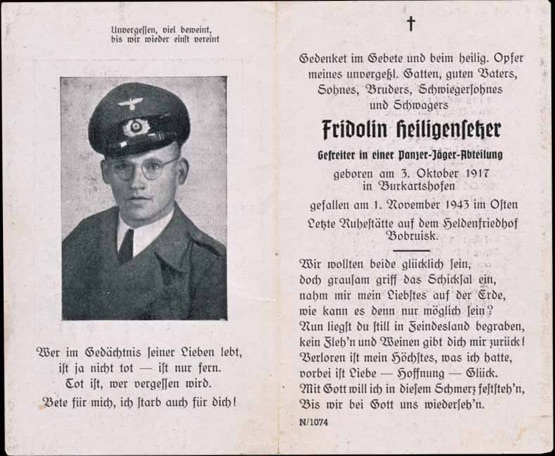 WW2 German Death Card (Sterbebild) for Gefreiter Fridolin Heiligensetzer, Panzer Jäger Abteillung. From Bukartshofen. Killed 1 November 1943, in the East, and layed to rest in the Bobruisk Cemetery. He was 25. Nice photo in an assault gunner’s uniform. Back of card has a grave rendering with his name on it. Double page card measures about 4.5 x 5.5 inches. Includes a slip from the German Graves Office listing him as dieing in military hospital 4-531, Bobruisk and being buried in Bobruisk, Russia. 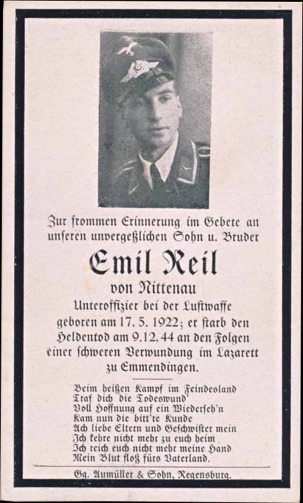 WW2 German Death Card (Sterbebild) for Luftwaffe Unteroffizier Emil Reil. From Nittenau. Died at the point of a difficult wound in the hospital in Emmendinger, 9 December 1944. He was 22. Back of card has a religious scene. Single page card measures about 2.25 x 4 inches. Includes a slip from the German Graves Office listing him asburied in Emmendingen, Germany. 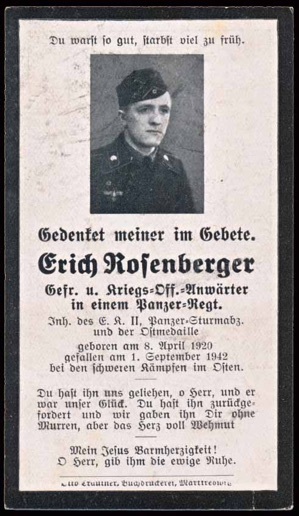 WW2 German Death Card (Sterbebild) forGefreiter and war-time officer candidate Erich Rosenberger, Panzer Regiment. Awarded the Iron Cross 2nd Class, Tank Assault Badge and Russian Front Medal. Killed in the difficult fighting in the East, 1 September 1942. He was 22. Back of card has Mary and baby Jesus. Single page card measures about 2.5 x 4.5 inches. Includes a German Graves Office slip listing him as killed in Snamenskoje and buried in Rshew, Russia. Soldat Georg Donharl, Grenadier Regiment. Killed in the East, 30 August 1941. He was 20. Includes German Graves Office slip listing him as killed by Witowka and buried in Potschep, Russia. 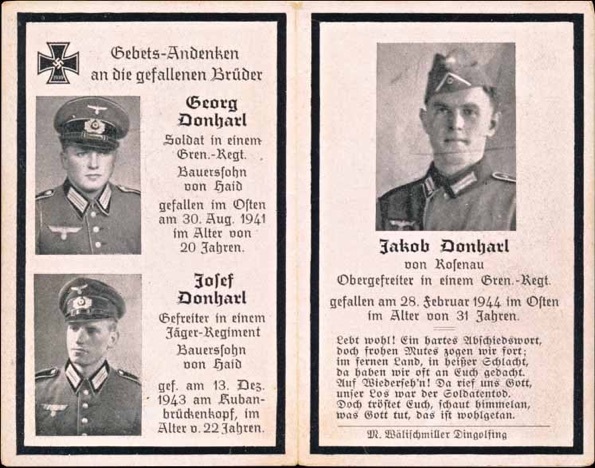 Gefreiter Josef Donharl, Jaeger Regiment. Killed 13 December 1943, Kuban Bridgehead. He was 23. Includes German Graves Office slip listing him as killed in the Kuban area and buried in Apscheronsk, Russia. 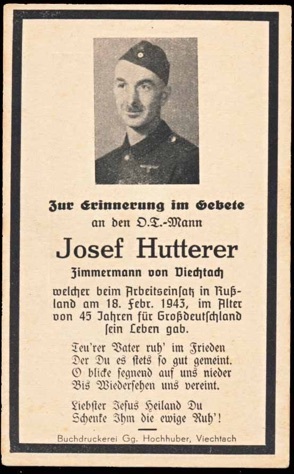 WW2 German Death Card (Sterbebild) for Organisation Todt Mann Josef Hutterer. Cabinet maker from Diechtach. Killed in Russia while engaged in his service work, 18 February 1943. He was 45. Back of card has Jesus. Single page card measures about 2.5 x 4.5 inches. Obergefreiter Jakob Donharl, Grenadier Regiment. Killed 28 February 1944, in the East. He was 31. Includes German Graves Office slip listing him as dieing in hospital 6-III Kauen and buried in Kauen, Lithuania. Back of card has religious renderings. Single sided double page card measures about 4 x 5 inches.